We'll be sharing our version and verdict of the Tur-Chicken Club Burger on the following Monday. I think that's it for the week. Hope you have a tasty week! 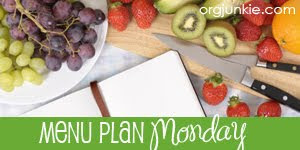 Be sure to visit Organizing Junkie for other menu plans! We're loving the Fruity Breakfast Burritos here to!